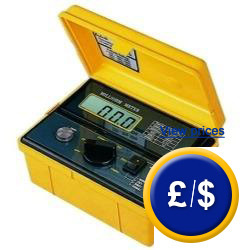 This electric resistance tester comes with a big 3½ - digit LCD display that shows the measurement values, which are very easy to read. With the electric tester you will be able to measure electric resistance from 100 μΩ up to 2000 Ω. For the determination of the measurement values, a constant electric current is introduced inside the object to test the voltage drop in it. Electric resistance tester has a housing protected against water and also it is delivered calibrated. You can request an ISO calibration certificate. - It can be used to measure electric resistance in engine coils, generators, transformers, commutation circuits, for instance in parallel or adjoining commutation circuits, compressed commutation circuits or commutators and relays. - To measure binding energy in mines, planes, boats and also for both industrial and home installations. - Pitch control in cyclic systems (Ringbus) to be used in industry and home. - To test and measure Read contacts. - Compression elements control over line current cables, for the control and maintenance of components such as connectors, contacts. - Protection against high temperatures and pressures. - LED indicator when temperature, Rp and Rc limits are exceeded. 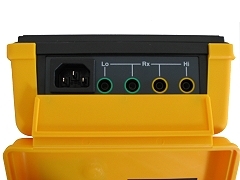 When the yellow protective cover of the electric resistance tester is removed, you will see the cable connection block. Adapter is included to connect to the mains and also there are four grafts (2 green and 2 yellow grafts) to connect control cables. This tester has a double tap. Connections lay out (according to the function: ground meters) can be found at user manual (see above).